As director of sports broadcasting for Dickinson College’s radio station, WDCV, Brian Schwartz ’13 learned the power of the media firsthand. 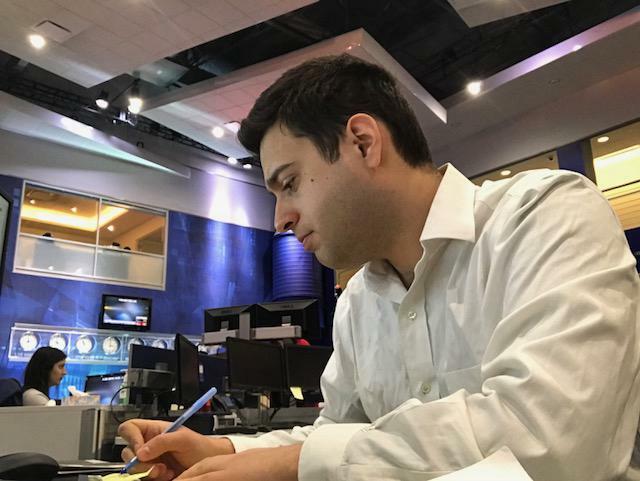 The college's useful liberal-arts education also gave the former American studies major the tools to carve out a successful reporting career, and today he plays a vital role in the "fourth estate" as a political finance reporter for CNBC, where he breaks stories about the role finance plays in politics. Dickinson’s liberal-arts approach was a key component in determining which career path I wanted to take. My major, American studies, was broad enough to give me extensive writing tools, show me the intricate history of the news media and provide an understanding of the importance of an informative press, also known as the fourth estate. My favorite organization at Dickinson College was the radio station, WDCV. It was there where I became the director of sports broadcasting and did the play by play for some of the school's biggest games. I also had the privilege of leading a great group of student broadcasters who had my back for four years. We were a great unit, and I’m forever grateful to them. A great memory at Dickinson was when Nick Young’ 13, Ray Irizarry ’13 and I called the Centennial Conference men’s basketball championship game versus Franklin & Marshall in our senior year. The Red Devils went on to beat their rivals and pick up the first basketball trophy since 1997. It was a special moment for anyone who followed the team, including us as we traveled around the league with them throughout that year. After the game, we interviewed head coach Alan Seretti, and he told us that we would be talking about that game at our weddings post-graduation. With that, I recently asked Nick to be my best man at my wedding in September and I will be going to his in August. I stay in touch with many of the people I knew from my Dickinson days. I always keep track of how the teams are doing as well. I think it’s important to keep up with the college you graduated from in one way or another because in many cases it was where you started your journey to be who you are today. The same can be said for me as a Dickinson graduate. I really started to get interested in reporting when I worked for a senior correspondent at FOX Business named Charlie Gasparino. He became a mentor of mine and showed me the true value of becoming an investigative reporter. It was with him that I first began breaking a number of stories on the Trump administration, the crafting of the tax reform bill and the health care initiative that eventually failed to pass in Congress, as well as other big scoops on the 2018 congressional midterm elections. I now work at CNBC as a political finance reporter. My job is to deep-dive into all things money in politics. Whether that’s about some of the top mega-donors in the United States or which special interests are influencing lawmakers, my role is to break stories about the role money plays in the world of politics. For instance, I recently broke a story about how leaders of the Koch Network are unhappy about President Donald Trump threatening tariffs on Chinese imports. The network is financed by two of the most influential billionaires in politics, Charles and David Koch. I posed the question within that story on whether the administration will back down from the tariffs now that some Republican financiers are turning on the president. The most challenging part of my job is balancing the importance of breaking a story and giving everyone a fair chance to comment. When you write a story about a high-profile official, for instance, my best advice to anyone is allow that person to give you a comment. If you jump the gun too fast, you may miss an opportunity to advance the story even further. There have been a bunch of unforgettable moments, but the most recent is getting the opportunity to be a reporter at CNBC. If I could have dinner with anyone famous, it would be with Carl Bernstein and Bob Woodward. The 1970s to see the unraveling of the Pentagon Papers.